Invisible Analysis: WHERE US ECONOMY IS HEADING? In this article we will try to figure out the true picture of US economy through some prime indicators and the probale ways by which US economny can try to come out of the dark woods.We will try to find the trend,analyse and foresight the future of the US economy. The unemployment rate rose from 9.8% to 10.2% in October, the U.S. Bureau of Labor Statistics reported. It was the first time the unemployment surpassing 10% in 26 years. In the coming quarters we will find many more job losses backed due to low economic growth and manufacturing process. 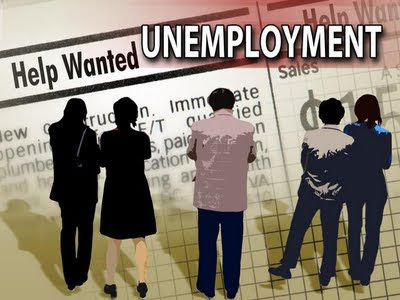 Rising unemployment has many effects on the economic growth of the country. 1. It not only place more pressure upon the benefit system, but with more and more funding required to keep the economic heart beat going on. 2. It reduces taxable income resulting less revenue for the government. This increases the fiscal deficit of the US economy. 4. The knock-on effects will be reduced spending within the US economy which will lead to cost-cutting, pricing pressure and ultimately more job losses.The below chart shows the rising unemployment in US economy. Hence we could find more clear pictures of the present troubled situation of US economy followed with the bleak growth prospect of US economy. I would like to accentuate here that we investors have all around have accepted some how the other that US economy is coming out of the dark woods and is on the recovery path. We believe this testimony on the basis of the Dow Jones scaling up to and beyond 10000 levels from the March lows. So finally we are all making the benchmark of economic growth on the basis of the Dow Jones and other indices scaling up high. I am deeply regretted to say that we are all living on fool’s paradise. Economic growth never happens on the wheel of Stock Market uptrend. It happens particularly in US on the basis of more job creation. When the job creation will happen in US economy the real growth journey of the economy will happen. If we look far beyond what we came to know from the other prospective data we find that more clearly the vision of US economic growth. US consumer confidence as measured by the Conference Board further deteriorated in October to 47.7, well below the 53.4 recorded in September. Only during four previous periods in the history of the survey, which dates to 1967, has the index plunged as low as the reading of 62.5. The consumer index has a great role to measure the economic as well as the stock market growth. 1. Consumer confidence is important to the economy because consumer spending drives 70% of economic growth. 2. The Consumer Confidence Index is watched by stock market analysts and investors to get an idea of whether consumer spending will continue to drive the economy. 3. The stock market can move dramatically on the day the Index is published. However, this will probably only happen if there is a lot of uncertainty about the economy. Job loss has made the US citizens more prune to savings and less consumption. Now what may happen beyond this is the most important point to this think since US is no longer in consumption mood and exports of other countries have taken a major hit. Moreover US economy is imposing various stringent import duties on various countries export. This will lead to global detoriation in the demand and supply, manufacturing and economic balance of payments. The consumer credit segment have taken a another major hit which has strengthen the slow US economic recovery. Total U.S. consumer credit dropped by a bigger-than-expected $14.80 billion in September, Federal Reserve data showed on Friday, indicating households prefer to reduce debt and are still reluctant to spend.The below chart shows the US consumer index.We find that the from 2004 to 2008 3rd Quarter the dropping in the consumer index have being consistent in fall with rise 2006-07 in between and finaly took a plunge in the current condition. When the effects of US consumer credit fall deepens the growth prospect of the economy .Even with zero % interest rates the federal reserves banking system is unable to attract the consumers. Their is only one reason behind this is that the US consumers are skeptical regarding the job prospects in the coming future, inclined to save more for the coming worst days and don’t want to pay any more debts. In fact the zero% interest rates in not exactly serving the intended purpose of the consumers but may be for the US corporate who are still busy in bailout process and foreclosure. US economy is not exactly in the process of coming out of recession. 1. We are yet to face the after effects of the earth quack of the September 2008 in the US economy. 2. Until there is job creation which will back up the consumer spending as well as the US citizens will be cushioned to go for borrowings the economy will never come out of recession. 3. Now the foremost outlook of the US should be creation of jobs. But this will process will emerge as a threat for all those economies who earn their livings on the US economy. 4. Since at present situation employment can only be generated by increasing the import duty and making the domestic goods cheaper as to the rest of the world. In the coming days we should not get surprised if US economy starts the process of dumping their goods in other countries. 1. Since that’s how US can create employment and can start coming out of the recession. 2. Unless the US industry gets into manufacturing process the US citizen will not find any job. 3. Moreover unless that manufactured product is sold at a cheap price as compared to others will not generate income for the labors. In the coming days we will not only find stringent import duties in the US economy but will also try to make its goods cheap. History has shown it is very difficult and often very expensive to escape from this vicious circle of job cuts, cost cuts, job cuts, cost cuts, etc although the government cannot afford to sit back and let the situation deteiorate further.